Ali didn’t go to college, but would anyone claim he was not clever? Ali wasn’t a Christian, but who doubt that he was touched by God? Ali was not a learned man of letters, but was he not a poet? Ali never led a movement, but wasn’t he a leader? I don’t need heroes. I need inspirations. Men and women who live their lives in such a way that they motivate me to push a little further, dig a little deeper, try a little harder. A man like Muhammad Ali inspires a man like me. The G.O.A.T. (Greatest of All Time, naturally) turns 68 today and even now remains in my mind the single greatest athlete this nation has ever produced. That Ali left a bigger footprint than anyone ever did in boxing is beyond question. No one comes close to being such an iconic figure who is universally recognized anywhere on the planet. I was born between two remarkable men: Dr. Martin Luther King, Jr. and Ali. Odds are I will never do anything remotely as memorable as they did, but that I am even able to aspire to their level of achievement pays homage to their greatness. As I said, I don’t have heroes. To my mind a hero is anyone who does what needs be done when the need is greatest. There are heroes on the ground in Haiti racing the clock to save lives and bring aid and comfort to those desperately needing it. These nameless and faceless people will receive no championship belts and no parades will be held for them when they return home. Yet in their own quiet way they are accomplishing great deeds that are as grand as any knockout Ali delivered in the ring. Do I take a certain pride in the G.O.A.T. being a Black man? Sure I do, but not in any kind of superiority way. If you believe the hype you’d think every Black man in America was either going to jail or coming out of it. You’d think we were illiterate brutes good only for dunking basketballs, running from cops, making babies we won’t take responsibility for and shooting each other on Saturday night for one dumb reason or another. Muhammad Ali proved it was not only possible to crossover and win the acclaim and respect of the White Man’s world, but you could do so and not lose your soul in the process. It’s always a delicate balancing act to navigate through a society not of your own making and keep your moorings. It is not a requirement to sell out to get over. Ali proved it could be done. Ali would play the clown but never the fool. He fought for money but he never sold out. He could be loud, brash and even obnoxious, but he stayed out of trouble and kept his business private. Ali was a class act. 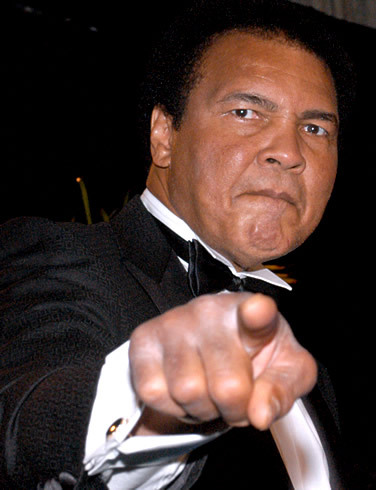 On the short list of people I would be in awe of were I ever to meet them, Ali ranks high on the short list. Sure he isn’t the Mouth That Roared any longer as Parkinson’s Disease has robbed the world of his eloquence. Still, even to be in the presence of such greatness would be a moment to cherish. In this time of manufactured celebrities whose claim to fame is they appeared on a reality television show or parlayed some meager deed into major acclaim, watching highlights of Ali fights on ESPN is the closest my kids will get to the unmatched brilliance of a transformative figure such as Muhammad Ali. I feel sorry for them but glad for myself that I lived in a time where I heard Dr. King’s words as they were uttered and saw the Ali Shuffle in motion. Being a fan of boxing without liking Ali would be like being a fan of rock n’ roll and disliking Jimi Hendrix or being a fan of jazz but thinking Duke Ellington is overrated. It just makes no damn sense. Boxing would have been dead long ago had it not been for the power and personality of a Ali keeping it alive. One reason why the sport is dormant and nearly dead now is because there’s no Ali to cheer for or root against. How many kids want to be a boxer now? Those boys that would shadowbox in the backyard now see wrestlers and ultimate fighting as the way to proving their manhood. The world sure could use another Muhammad Ali. We probably won’t get that lucky again. ← Haiti Matters. Conan, Pat, Rush and Jay Don’t. I don’t need heroes. I need inspirations. That is wonderfully said. This piece is beautifully written with a power that comes from deep within. Inspirations like Ali don’t seem to exist these days. It’s almost like the genuine are being marginalized while the fabricated are exalted. Integrity, character and perseverance are traits missing from the modern “role model”, replaced with selling out, emptiness and instant gratification. Thank you for reminding us of a time when people could change the world simply by being true to themselves without compromise.